Background: Multiple trials have been tried to prevent hypotension during spinal anesthesia. However, the drug choice and mode of administration is still a matter of debate. Objectives: To compare the outcome of spinal injection of hyperbaric bupivacaine and fentanyl separately to standard injection of mixed fentanyl with hyperbaric bupivacaine. Settings and Design: A randomized, controlled clinical trial. Patients and Methods: One hundred twenty-four parturient scheduled for elective cesarean section were randomly allocated into two groups, each 62 parturient: Group M received spinal anesthesia using 10 mg bupivacaine 0.5% premixed with 25 μg fentanyl in the same syringe and Group S received 25 μg fentanyl in one syringe and 10 mg bupivacaine 0.5% without barbotage in a second syringe. Results: Patients with intraoperative pain that was controllable without the need for a shift to general anesthesia was significantly lower in Group S (3.2%) than in Group M (16.1%). The frequency of hypotension was significantly lower in Group S compared to Group M (P < 0.05). 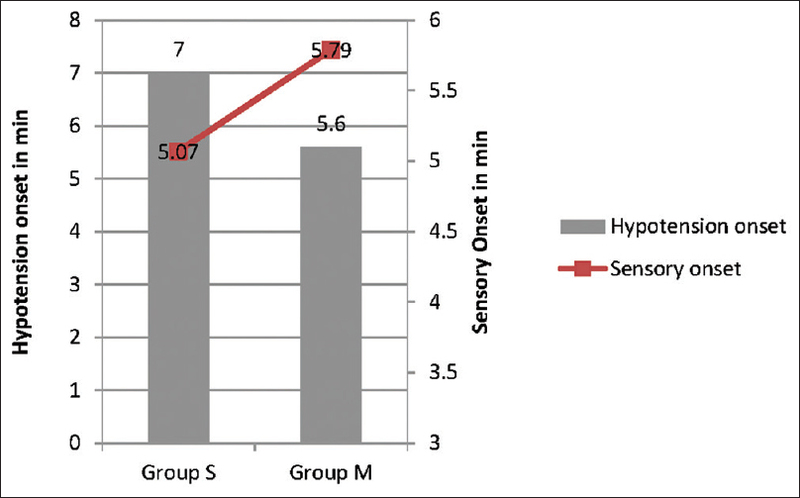 Time till the onset of sensory block was nonsignificantly shorter with nonsignificantly higher mean level of maximal sensory block in Group S compared to Group M (P > 0.05). There was no significant difference in the time till occurrence of hypotension, duration of hypotension, mean dose of ephedrine used for the treatment of hypotension and frequency of patients developed itching between the groups (P > 0.05). Conclusion: Separate intrathecal injection of fentanyl and hyperbaric bupivacaine provided a significant improvement in the quality of sensory block and significant reduction of the frequency of hypotension compared to injection of mixed medications. Fentanyl is a lipid soluble opioid with rapid onset of action, within 5 min, after intrathecal injection. It significantly reduces pain during CS when added to bupivacaine. Meanwhile, intrathecal administration of fentanyl 25 μg in no laboring term parturient does not produce clinically important maternal hemodynamic changes. The current study aimed to compare the effect of spinal injection of hyperbaric bupivacaine and fentanyl separately to the standard injection of mixed fentanyl with hyperbaric bupivacaine. The current prospective double-blind randomized controlled study was conducted at Dr. Soliman Fakeeh Hospital, KSA, from 5/2013 to 10/2014. After approval of the study protocol by the Local Ethical Committee and obtaining fully informed written patients' consents, 124 parturient at full-term scheduled for elective CS with uncomplicated pregnancy were included in the study. Exclusion criteria included parturient with body weight <50 kg or >90 kg, height <150 cm or >170 cm, preeclampsia, any major systemic disease, contraindication to regional anesthesia or allergy to used medications. All patients attended the theater fasting at least 6 h and without administration of premedications or preoperative intravenous (IV) fluids. Patients (parturient primi or multigravid) were randomly allocated into two groups (62 parturient in each group): Group M included parturient received spinal anesthesia using 10 mg bupivacaine 0.5% premixed with 25 µg fentanyl in the same syringe and Group S included parturient received the same medications sequentially without premixing using two different syringes; the first was lodged by 25 µg fentanyl and the second was lodged by 10 mg hyperbaric bupivacaine 0.5% without barbotage. All medications were prepared before insertion of the spinal needle. Timing between the first and second syringes was kept as low as possible to prevent CSF loss with part of the fentanyl dose. Demographic data including age, height, and weight were determined preoperatively. Drugs were injected through Quincke spinal needle, 25-gauge, inserted in the L3-4 interspace. Spinal anesthesia was done in sitting position then the parturient asked to lie down immediately after bupivacaine injection. Envelopes containing the two techniques were placed in a box. One anesthesiologist in our hospital gave spinal anesthesia to all the cases, and he is not from the research team and not sharing in postspinal management and recordings. He randomly picked an envelope and followed the technique written inside without informing the parturient about it. The research anesthesiologist entered the room immediately after spinal anesthesia and was unaware of the technique used. He recorded the results on a paper labeled with the patient's file number. IV fluid co-load was given in a dose of 15 ml/kg warm lactated ringer solution started as fast drip during and continued after spinal anesthesia application through 18-gauge IV cannula. Demographic data including age, height, and weight were determined preoperatively. Sample Power was calculated according to Kraemer and Theimann  using the proposed figure showed the sample size for 60% power would require an N of more than 30/group, 80% power would require an N of 50/group. Thus, the power to be >80% for assuring an effect, thus the current study sample size was chosen, after conducting a pilot study and collecting data from other studies, to be 62 patients per group to reach a point of significance of <0.05. Obtained data were presented as a mean ± standard deviation, ranges, median, numbers, and ratios according to requirement. Results were analyzed using Wilcoxon; ranked test for unrelated data (Z-test) and Chi-square test (χ2 test). Statistical analysis was conducted using the SPSS (version 15, 2006, SPSS Inc., Chicago, IL.) for Windows statistical package. P <0.05 was considered statistically significant. From 139 consecutive parturient assessed for eligibility, 12 did not fulfill inclusion criteria and were excluded. Three more parturient refused participation in the research. Finally, 124 parturient were randomized into two groups 62 in each group. All parturient enrolled in the study were closely followed up. All the 62 parturient in each group were considered for analysis [Figure 1]. Among the 124 parturient; 82 women were primipara, while 42 women were multipara. All were full-term with a mean gestational age of 37.8 ± 0.8; range: 37–39 weeks. The mean age of enrolled parturient was 28.2 ± 2.4; range: 23–33 years, 104 were of the American Society of Anesthesiologists (ASA) grade I and 20 were ASA II grade. Parturient inclusion data are shown in [Table 1], there was nonsignificant difference between both groups of enrolled parturient. All patients passed smooth intraoperative course without complications within a mean duration of surgery 45.6 ± 7.2; range: 30–55 min with no significant difference between both studied groups. Hypotension was recorded in 50 patients (40.3%): 32 in Group M and 18 in Group S with significantly lower (χ2 = 6.56, P < 0.05) frequency of hypotension in Group S compared to Group M. Early hypotension occurred in 11 patients (17.7%) in Group S which is significantly lower than those in Group M (28 patients 45.2%). However, Late hypotension was nonsignificantly more in Group S, 7 (11.3%) compared to 4 (6.5%) in Group M. Meanwhile, mean lowest systolic blood pressure was nonsignificantly (Z = 0.643, P > 0.05) higher in Group S compared to Group M [Figure 2]. 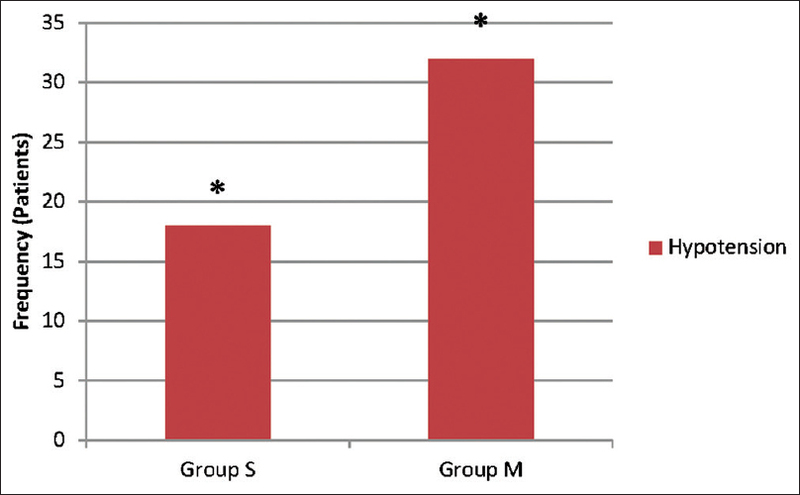 Time of occurrence of hypotension since spinal injection was nonsignificantly (Z = 1.444, P = 0.19) longer in Group S compared to Group M. Duration of hypotension was nonsignificantly (Z = 0.441, P = 0.671) shorter in Group S compared to Group M [Figure 3]. 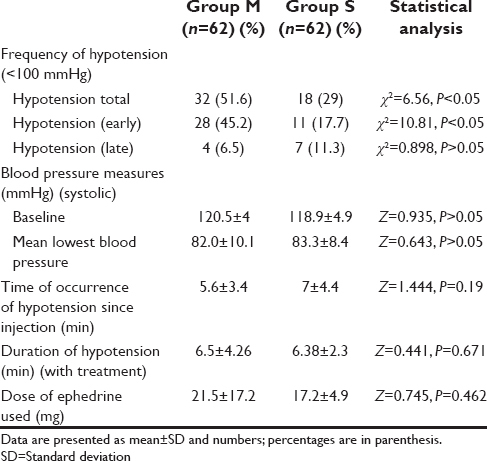 Mean dose of ephedrine used for the treatment of hypotension was nonsignificantly (Z = 0.745, P = 0.462) lower in Group S compared to Group M [Table 2]. Two patients (3.2%) had intraoperative pain that was controllable without the need for shift to general anesthesia which was significantly lower in Group S (P = 0.002) than those in Group M (10 patients 16.1%) [Figure 4]. No patients in both groups required conversion to general anesthesia. 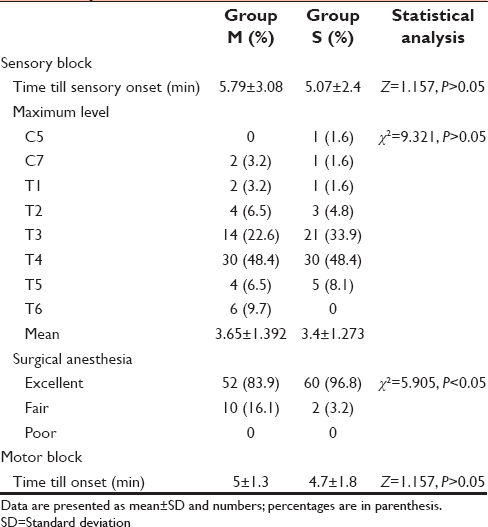 However, time till the onset of sensory block was nonsignificantly (Z = 1.157, P > 0.05) shorter in Group S compared to Group M. Mean level of maximal sensory block was nonsignificantly (Z = 9.321, P > 0.05) higher in Group S compared to Group M. Time till onset and recovery of motor block and Bromage grades were nonsignificantly different between both groups [Table 3]. 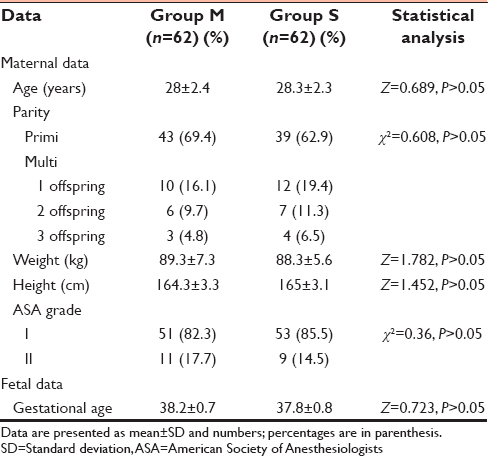 Mean 1-min and 5-min Apgar score was nonsignificantly (Z = 1.204 and 1.508, respectively, P > 0.05) different between both groups. Thirty patients (48.4%) in each group developed itching. However, only 6 patients (9.7%) in Group S required treatment, which is insignificantly lower than 14 patients (22.6%) in Group M. However, all patients responded well to IV chlorpheniramine maleate except two patients in Group M, who required naloxone. None of the patients of Group S required naloxone. 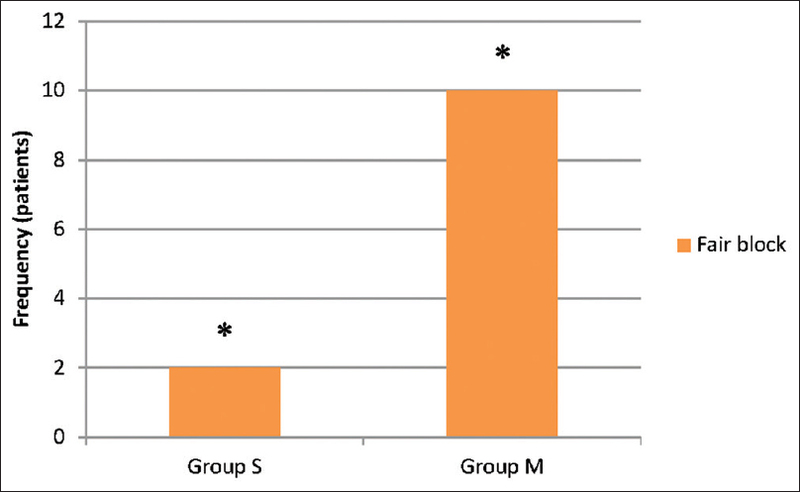 Fifteen patients developed nausea; 8 in Group M and 7 in Group S, and 7 patients had a vomiting attack; 3 in Group M and 4 in Group S without significant difference between both groups. Patients developed vomiting responded to IV metoclopramide. 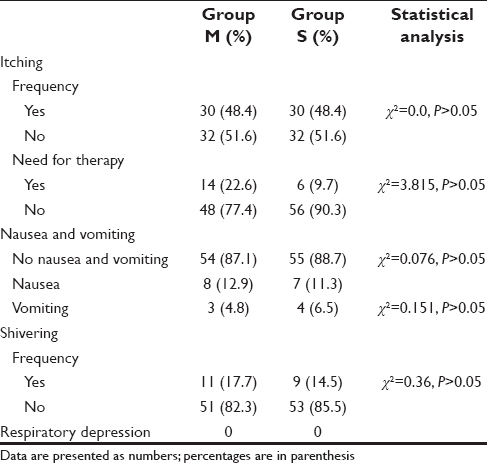 Twenty patients had mild shivering; 11 in Group M and 9 in Group S with no significant (χ2 = 2.638, P > 0.05) difference. No respiratory depression or any other complications, other than what mentioned above, was recorded in either group [Table 4]. The current study aims to compare the effect of spinal injection of fentanyl and hyperbaric bupivacaine sequentially to the standard injection of mixed fentanyl with hyperbaric bupivacaine in CS. We found that separate intrathecal injection of fentanyl and hyperbaric bupivacaine provided significant improvement in the quality of sensory block and significant reduction of the frequency of hypotension compared to injection of mixed medications. Late hypotension, occurring more than 30 min after spinal anesthesia, is observed in both groups with nonsignificantly more patients in Group S. It was first described by Kyokong et al., and the mechanism of this late-onset hypotension remains unidentified. In my opinion, some patients have moderately weak compensatory mechanisms in the upper half of the body which is exhausted after more than 30 min. Those patients tend to develop early hypotension in Group M, because of the more rapid sympathetic block and late hypotension in Group S.
The response to intrathecal medications with different baricity given sequentially was first studied by Cesur et al., who compared parturient received 10 mg hyperbaric bupivacaine with those who received 5 mg of plain and 5 mg of hyperbaric bupivacaine sequentially for spinal anesthesia. They found that parturients who receive 5 mg plain and 5 mg hyperbaric bupivacaine sequentially have lower incidence of hypotension compared with those who receive 10 mg hyperbaric bupivacaine. Serhan et al. studied spinal anesthesia with hyperbaric bupivacaine (10 mg), sequential administration of hyperbaric and isobaric bupivacaine (5 mg each), and isobaric bupivacaine (10 mg). They found no significant difference between all groups. Desai et al. studied two groups each 24 parturients received spinal injection for CS. The first group received 10 mg hyperbaric bupivacaine plus morphine 100 μg plus fentanyl 15 μg, mixed in a syringe prior to administration. The second group received 10 mg bupivacaine through one syringe, followed by morphine 100 μg plus fentanyl 15 μg through a separate syringe. They reported that patients received mixed medications had higher levels of sensory block to cold than those received separate injections and may be associated with the higher postoperative opioid requirement. In our work, there was no significant difference in levels. This difference could be because they injected hyperbaric bupivacaine before opioids, which went down to lower levels during injection of opioids and gave lower level in the separate group. In their study, the incidence of hypotension was insignificantly lower in Group S. They did not study the incidence of unsatisfactory block which is rare and needs a larger group number. Atalay et al. compared 10 mg hyperbaric bupivacaine intrathecally with 5 mg plain bupivacaine plus 35, 30, or 25 mg of meperidine administered sequentially. They concluded that sequential administration of 5 mg plain bupivacaine and 25 mg meperidine intrathecally provided better blood pressure stability and a lower incidence of side-effects than 10 mg hyperbaric bupivacaine alone. However, they did not compare the same medications mixed and sequentially. According to our knowledge, we are the first to compare mixed and sequential intrathecal hyperbaric bupivacaine with fentanyl using the same doses in CS. It will be better in the future studies to specify the temperature of the injected medications as it can affect baricity, also the rate of injection of medications should be specified. It could be concluded that separate intrathecal injection of fentanyl and hyperbaric bupivacaine provided significant improvement in the quality of sensory block and significant reduction of the frequency of hypotension compared to injection of mixed medications. The authors thank Dr. Hassan Ali Al Saleh, McMaster University, for generous support and valuable helping in statistical analysis. The authors also thank Dr. Essam Abo Baker, Anesthesia Consultant, Dr. Soliman Fakeeh Hospital, for helping with the study. Turkmen A, Moralar DG, Ali A, Altan A. Comparison of the anesthetic effects of intrathecal levobupivacaine+fentanyl and bupivacaine+fentanyl during caesarean section. Middle East J Anaesthesiol 2012;21:577-82. Havas F, Orhan Sungur M, Yenigün Y, Karadeniz M, Kiliç M, Özkan Seyhan T. Spinal anesthesia for elective cesarean section is associated with shorter hospital stay compared to general anesthesia. Agri 2013;25:55-63. Cyna AM, Andrew M, Emmett RS, Middleton P, Simmons SW. Techniques for preventing hypotension during spinal anaesthesia for caesarean section. Cochrane Database Syst Rev 2006;(4):CD002251. Paech MJ. Should we take a different angle in managing pregnant women at delivery? Attempting to avoid the 'supine hypotensive syndrome'. Anaesth Intensive Care 2008;36:775-7. Gur'ianov VA, Shumov IV. Neuro-autonomic inhibition and haemodynamics management optimization during cesarean section under spinal anaesthesia in pregnant women with gestosis. Anesteziol Reanimatol 2012;(6):48-51. Tyagi A, Kumar A, Girotra G, Sethi AK. Combined spinal epidural and epidural volume extension: Interaction of patient position and hyperbaric bupivacaine. J Anaesthesiol Clin Pharmacol 2011;27:459-64. Hwang JW, Oh AY, Song IA, Na HS, Ryu JH, Park HP, et al. Influence of a prolonged lateral position on induction of spinal anesthesia for cesarean delivery: A randomized controlled trial. Minerva Anestesiol 2012;78:646-52. Tamilselvan P, Fernando R, Bray J, Sodhi M, Columb M. The effects of crystalloid and colloid preload on cardiac output in the parturient undergoing planned cesarean delivery under spinal anesthesia: A randomized trial. Anesth Analg 2009;109:1916-21. George RB, McKeen D, Columb MO, Habib AS. Up-down determination of the 90% effective dose of phenylephrine for the treatment of spinal anesthesia-induced hypotension in parturients undergoing cesarean delivery. Anesth Analg 2010;110:154-8. Sia AT, Tan HS, Sng BL. Closed-loop double-vasopressor automated system to treat hypotension during spinal anaesthesia for caesarean section: A preliminary study. Anaesthesia 2012;67:1348-55. Jain K, Bhardwaj N, Sharma A, Kaur J, Kumar P. A randomised comparison of the effects of low-dose spinal or general anaesthesia on umbilical cord blood gases during caesarean delivery of growth-restricted foetuses with impaired Doppler flow. Eur J Anaesthesiol 2013;30:9-15. Palmer CM, Cork RC, Hays R, Van Maren G, Alves D. The dose-response relation of intrathecal fentanyl for labor analgesia. Anesthesiology 1998;88:355-61. Grant GJ, Susser L, Cascio M, Moses M, Zakowski MI. Hemodynamic effects of intrathecal fentanyl in non-laboring term parturient. J Clin Anesth 1996;8:99-103. White B. Measuring patient satisfaction: How to do it and why to bother. Fam Pract Manag 1999;6:40-4. Bromage PR, Burfoot MF, Crowell DE, Pettigrew RT. Quality of epidural blockade. I. influence of physical factors. Br J Anaesth 1964;36:342-52. Srivastava U, Kumar A, Gandhi NK, Saxena S, Dutta D, Chandra P, Singh S. Hyperbaric or plain bupivacaine combined with fentanyl for spinal anaesthesia during caesarean delivery. Indian J Anaesth 2004;48:44-6. Connolly C, McLeod GA, Wildsmith JA. Spinal anaesthesia for caesarean section with bupivacaine 5 mg ml(-1) in glucose 8 or 80 mg ml(-1). Br J Anaesth 2001;86:805-7. Helmi M, Uyun Y, Suwondo BS, Widodo U. Comparison of intrathecal use of isobaric and hyperbaric bupivacaine during lower abdomen surgery. J Anesthesiol 2014;2014:4. Martin R, Frigon C, Chrétien A, Tétrault JP. Onset of spinal block is more rapid with isobaric than hyperbaric bupivacaine. Can J Anaesth 2000;47:43-6. Kyokong O, Charuluxananan S, Pothimamaka S, Leerapun R. Hypotension in spinal anesthesia for cesarean section: A comparison of 0.5% hyperbaric bupivacaine and 5% hyperbaric lidocaine. J Med Assoc Thai 2001;84 Suppl 1:S256-62. Habib AS, Dale M, Emerson C, Allsager C, Victoria A. Reduction in pain during caesarean section following the addition of neuraxial opiates: A closed-loop audit. Int J Obstet Anesth 2002;11:17. Hala M, Juan C, Víctor W. Spinal additives in subarachnoid anaesthesia for cesarean section. Ch. 4. InTech; 2014. p. 67. Cesur M, Alici HA, Erdem AF, Borekci B, Silbir F. Spinal anesthesia with sequential administration of plain and hyperbaric bupivacaine provides satisfactory analgesia with hemodynamic stability in cesarean section. Int J Obstet Anesth 2008;17:217-22. Serhan YB, Volkan H, Dilek OR, Evrim BS, Erdoğan KG, Sedat H, et al. Effects on hypotension incidence: Hyperbaric, isobaric, and combinations of bupivacaine for spinal anesthesia in cesarean section. Turk J Med Sci 2012;42:307. Desai S, Lim Y, Tan CH, Sia AT. 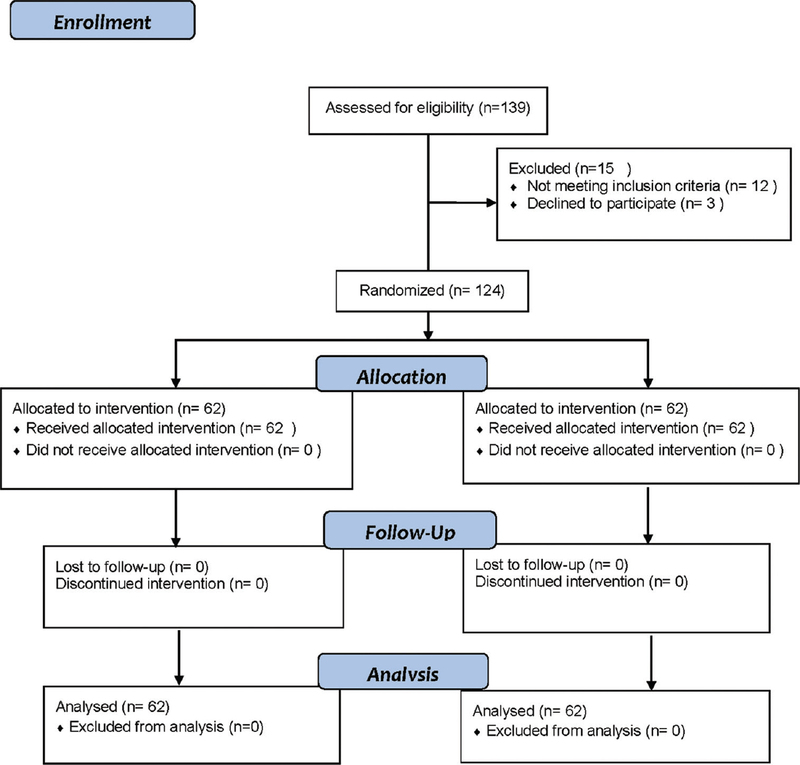 A randomised controlled trial of hyperbaric bupivacaine with opioids, injected as either a mixture or sequentially, for spinal anaesthesia for caesarean section. Anaesth Intensive Care 2010;38:280-4. Atalay C, Aksoy M, Aksoy AN, Dogan N, Kürsad H. Combining intrathecal bupivacaine and meperidine during caesarean section to prevent spinal anaesthesia-induced hypotension and other side-effects. J Int Med Res 2010;38:1626-36.